I’ve played plenty of modern video games, the ones that look so realistic that you’d swear you were watching TV. But I still have a fondness for old-school arcade games. You know, the ones that gobbled up so many of my quarters back in the 1980s. That’s what I was delighted when my son took me to the Coin-Op Game Room during our recent visit to Sacramento, CA. Coin-Op is bar and pizza joint nestled under an office building on K Street in downtown Sac. 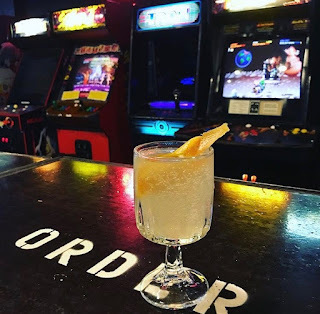 Yelp reviewers give it high marks for its beer list, but what really brings in the crowds are the vintage video games and pinball machines that line the walls. The selections include plenty of classics like Street Fighter II, Ninja Turtles, Galaxa, Paperboy, TRON, Contra NBA Jam, Mortal Combat, X-Men and, of course, Mr. And Ms. Pac-Man. Some of the screens are faded and I encountered one two-player shooting game where one of the guns was broken. But most of them worked just as well as they did when I played them at the Close Quarters arcade. And they’re still just as much fun.